This was a little run I did each morning starting the week after Gil Scott-Heron’s death. It was also around the time that Errol Hincksman died back in old New Zealand. The two were not related, but they may well have been – white powders drew them together. Mr Scott-Heron was a crack cocaine addict and a very fine musician and poet. They say he invented rap music, but to me, he just embedded the words in the groove deeper than probably anyone ever has. For his part Mr Hincksman was involved in the ‘Mr Asia’ drug ring of the 1970s in New Zealand (and around the world) and was apparently, at once, a rascal and a top bloke. I never met either of them and I’m going on media portraits and the words of close friends. Plus, I’m introducing my own feelings into these topics. That’s the lay of the land. I was having some problems with American Immigration and decided to go out and put up a few posters to clear my head. I always think it’s a good way to start the day and particularly if you don’t take it all too seriously. I was running low on poetry posters and yet had some Janet Frame, Tusiata Avia, and Roy Smith poems to put up. Thank god for that. 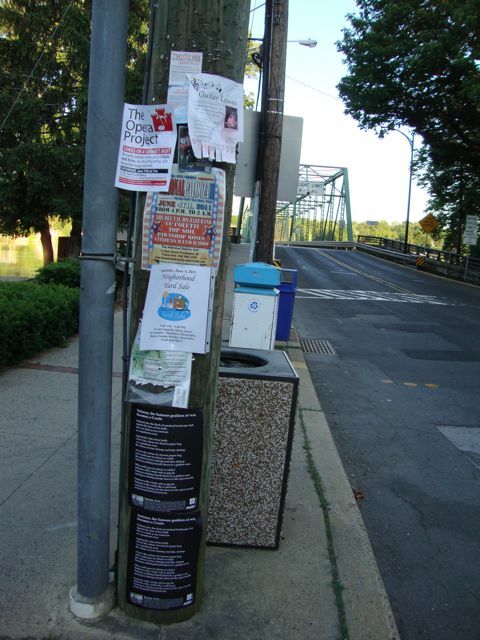 I always thought that when life gets complicated, the best thing to do is just to whack a poster on a lamp-post with a JT-21 heavy industrial stapler. If you start with one poster, before you know it you’ve forgotten yourself and you’ve put up two hundred, then you look back and you feel good. Then other people read the poems and they feel good too. Then, if you think about it, you’re alive and Gil Scott-Heron isn’t and nor is Errol Hincksman. But…. Aaah, I don’t know… The good get to die. It was forty years ago on June 17th that Richard Nixon declared the US ‘War on Drugs.’ This is a war that has seen forty million arrests and no visible results except that it has ruined the lives of millions of people in too many ways to list. So, as they often say about these kinds of things: the War on Drugs actually does more damage than the situation which it purports to cure. There just aren’t enough prisons to lock everyone up and there’s a whole new type of hypocrisy crawling the streets these days. I think Mr Scott-Heron knew this hypocrisy quite well. He did at least two terms on Riker’s Island and prisons are always where you get to witness hypocrisy first hand. You see people doing life sentences for stealing a thousand bucks and you wonder where are the bankers/politicians /media barons who created the world wide debacle that everyone is suffering from these days. You wonder why these people are not in jail for all the destruction they have bought about. In fact, the next time you see a photo of one of them they are wearing a new suit. You might turn on ‘Entertainment Tonight’ and forget it all or Oprah may seduce you into thinking that things aren’t really that bad at all. But they are worse… And you know it, so you put up a poster. Just one. 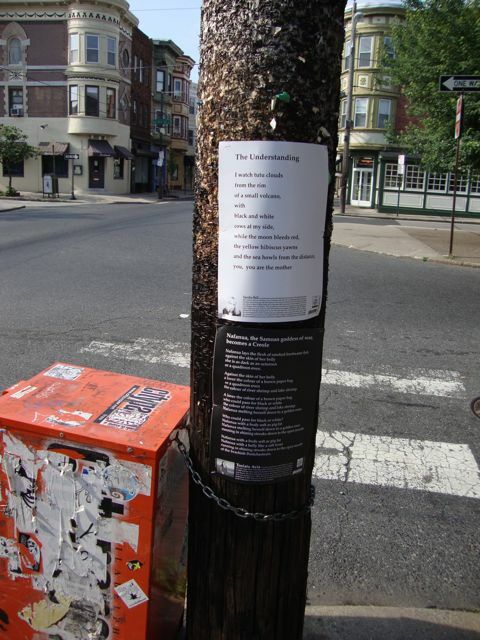 Here’s how to put up a poem poster in another way: walk into a Starbucks or a Borders Books or any one of a number of places that have notice boards and whack one on said notice board. Don’t ask a staff member, in these places no one has authority to do much at all and you may be trapped into waiting for forty-five minutes whilst the store manager calls the regional manager who then calls someone in Sioux Falls who does have some sort of authority but is most probably away on holiday… Then someone else calls someone in Utah who is out at church and suggests you call in again tomorrow. Then you thank them for their input and they say “You’re welcome” and you remember that you are in America. It’s because of those sentiments that I love Gil Scott-Heron and also Errol Hincksman. I think they were both probably real people who weren’t particularly afraid of cutting their own pathway and neither was franchised. No one called Sioux Falls, nor had to. So to me, they lead meaningful lives. Phantom Billstickers was built, quite unashamedly, on going against the tide. That’s what I prefer to think it still stands for. For me, it is some kind of gnarled first against the forces of mediocrity and bureaucracy. It has now survived several earthquakes and so many strange occurrences that it would take me all day to write about them and possibly all year. It has survived many plagues of locusts, do-gooders, hanger-ons, and huge egos split so many ways that they made/make the Southern Cross seem small. I’m dead proud of it and I’m dead proud of the team currently working to take poetry to the world and gigs and music to the streets of New Zealand. So I start the day by putting up a simple poster. And I keep my feet on the ground. RIP Errol Hincksman and Gil Scott-Heron.